Principia Is A Work By Sir Isaac Newton On Mathematics. Principia is a three-volume work by Isaac Newton. 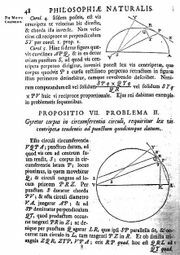 The Principia or Philosophia Naturalis Principia Mathematica (Latin: "mathematical principles of natural philosophy", often Principia or Principia Mathematica for short) is a three-volume work by Isaac Newton published on July 5, 1687. The Principia contains the statement of Newton's laws of motion forming the foundation of classical mechanics as well as his law of universal gravitation. He derives Kepler's laws for the motion of the planets (which were first obtained empirically). Newton's own copy of his Principia, with handwritten corrections for the second edition. In formulating his physical theories, Newton had developed a field of mathematics known as calculus. However, the language of calculus was largely left out of the Principia. Instead, Newton recast the majority of his proofs as geometric arguments. It is in the Principia that Newton expressed his famous Hypotheses non fingo ("I feign no hypotheses"). Principia: The historical context. The beginnings of the scientific revolution. Nicolaus Copernicus had firmly moved the Earth away from the centre of the universe with the heliocentric theory for which he presented evidence in his book De revolutionibus orbium coelestium (On the revolutions of the heavenly spheres) published in 1543. The structure was completed when Johannes Kepler wrote the book Astronomia nova (A new astronomy) in 1609, setting out the evidence that planets move in elliptical orbits with the sun at one focus, and that planets do not move with constant speed along this orbit. Rather, their speed varies so that the line joining the centres of the sun and a planet sweeps out equal areas in equal times. To these two laws he added a third a decade later, in his otherwise forgettable book Harmonices Mundi (Harmonies of the world). This law sets out a proportionality between the third power of the characteristic distance of a planet from the sun and the square of the length of its year. The foundation of modern dynamics was set out in Galileo's book Dialogo sopra i due massimi sistemi del mondo (Dialogue on the two main world systems) where the notion of inertia was implicit and used. In addition, Galileo's experiments with inclined planes had yielded precise mathematical relations between elapsed time and acceleration, velocity or distance for uniform and uniformly accelerated motion of bodies. Descartes' book of 1644 Principia philosophiae (Principles of philosophy) stated that bodies can act on each other only through contact: a principle that induced people, among them himself, to hypothesize a universal medium as the carrier of interactions such as light and gravity-the aether. Another mistake was his treatment of circular motion, but this was more fruitful in that it led others to identify circular motion as a problem raised by the principle of inertia. Christiaan Huygens solved this problem in the 1650s and published it much later. Newton had studied these books, or, in some cases, secondary sources based on them, and taken notes entitled Quaestiones quaedam philosophicae (Questions about philosophy) during his days as an undergraduate. During this period (1664-1666) he created the basis of calculus, and performed the first experiments in the optics of colour. In addition he took two crucial steps in dynamics: first, in the course of an analysis of the impact between two bodies, he deduced correctly that the centre of mass remains in uniform motion; second, he made his first, but mistaken, analysis of circular motion assuming that there must exist a (repulsive) centrifugal force. At this time, the central notion of inertia still remained outside his understanding. He summarized this work in a note that he called"The lawes of Motion" (preserved in the Cambridge University Library as the Additional MS 3958). Over the following years, he published his experiments on light and the resulting theory of colours, to overwhelmingly favourable response, and a few inevitable scientific disputes with Robert Hooke and others, which forced him to sharpen his ideas to the point where he composed sections of his later book Opticks already by the 1670s. He wrote up bits and pieces of the calculus in various papers and letters, including two to Leibniz. He became a fellow of the Royal Society and the second Lucasian Professor of Mathematics (succeeding Isaac Barrow) at Trinity College, Cambridge. In the plague year of 1665, Newton had already experienced the famous revelation under an apple tree in Woolesthorpe, which led him to conclude that the strength of gravity falls off as the inverse square of the distance, by substituting Kepler's third law into his derivation of the centrifugal force (muddled as it was through his misunderstanding of the nature of circular motion in The lawes of motion). Hooke, in 1674, wrote Newton a letter (later published in 1679 in his book Lectiones Cutlerianes) through which Newton first understood of the role of inertia in the problem of circular motion- that the tendency of a body is to fly off in a straight line, and that an attractive force must keep it moving in a circle. In reply Newton drew (and described) a fancied trajectory of a body, initially with only tangential velocity, falling towards a centre of attraction in a spiral. Hooke noted this error and corrected it, saying that with an inverse square force law the correct path would be an ellipse, and made the exchange public by reading both Newton's letter and his correction to the Royal Society in 1676. Newton tried a rearguard action by giving the orbits in various other kinds of central potentials in another letter to Hooke, thus showing his mastery over the method. In 1677, in a conversation with Christopher Wren, Newton realized that Wren had also arrived at the inverse square law by exactly the same method as he. Reflections on what can be deduced from common sense about aspects of circular motion brought him to his concept of "absolute space". In the Principia Newton presents the example of a rotating bucket to show that in everyday life it can readily be discerned that in a rotating motion another factor besides the motion relative to other objects is involved. Newton had still not completed all the steps in the construction of the Principia by 1681, when a comet was observed to turn around the sun. The astronomer royal, John Flamsteed, recognised the motion as such, whereas most scientists believed that there were two comets, one that disappeared behind the sun, and another that appeared later from the same direction. The correspondence between Flamsteed and Newton showed that the latter had not appreciated the universality of the law of gravity. This was the state of affairs when Edmund Halley visited Newton in Cambridge in August 1684, having rediscovered the inverse-square law by substituting Kepler's law into Huygens' formula for the centrifugal force. In January of that year, Halley, Wren and Hooke had a conversation where Hooke claimed to not only have derived the inverse-square law, but also all the laws of planetary motion. Wren was unconvinced, and Halley, having failed in the derivation himself, resolved to ask Newton. Newton said that he had already made the derivations but could not find the papers. Matching accounts of this meeting come from Halley and Abraham De Moivre to whom Newton confided. In November 1684, Halley received a treatise of nine pages from Newton called De motu corporum in gyrum (On the motion of bodies in an orbit). It derived the three laws of Kepler assuming an inverse square law of force, and generalized the answer to conic sections. It extended the methodology of dynamics by adding the solution of a problem on the motion of a body through a resisting medium. After another visit to Newton, Halley reported these results to the Royal Society on December 10, 1684 (Julian calendar). Newton also communicated the results to Flamsteed, but insisted on revising the manuscript. These crucial revisions, especially concerning the notion of inertia, slowly developed over the next year-and-a-half into the Principia. Flamsteed's collaboration in supplying regular observational data on the planets was very helpful during this period. The text of the first of the three books was presented to the Royal Society at the close of April, 1686. Hooke's priority claims caused some delay in acceptance, but Samuel Pepys, as President, was authorised on 30 June to license it for publication. Unfortunately the Society had just spent their book budget on a history of fish, so the initial cost of publication was borne by Edmund Halley. The third book was finally completed a year later in April, 1687, and published that summer. Principia: The contents of the book. It was perhaps the force of the Principia, which explained so many different things about the natural world with such economy, that caused this method to become synonymous with physics, even as it is practiced almost three and a half centuries after its beginning. Today the two aspects that Newton outlined would be called analysis and synthesis. De motu corporum (On the motion of bodies) is a mathematical exposition of calculus followed by statements of basic dynamical definitions and the primary deductions based on these. It also contains propositions and proofs that have little to do with dynamics but demonstrate the kinds of problems that can be solved using calculus. 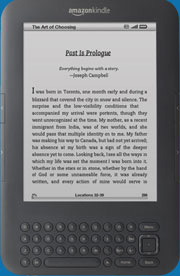 The first book was divided into a second volume because of its length. It contains sundry applications such as motion through a resistive medium, a derivation of the shape of least resistance, a derivation of the speed of sound and accounts of experimental tests of the result. De mundi systemate (On the system of the world) is an essay on universal gravitation that builds upon the propositions of the previous books and applies them to the motions observed in the solar system - the regularities and the irregularities of the orbit of the moon, the derivations of Kepler's laws, applications to the motion of Jupiter's moons, to comets and tides (much of the data came from John Flamsteed). It also considers the harmonic oscillator in three dimensions, and motion in arbitrary force laws. The quantity of matter is that which arises conjointly from its density and magnitude. A body twice as dense in double the space is quadruple in quantity. This quantity I designate by the name of body or of mass. This was then used to define the "quantity of motion" (today called momentum), and the principle of inertia in which mass replaces the previous Cartesian notion of intrinsic force. This then set the stage for the introduction of forces through the change in momentum of a body. Curiously, for today's readers, the exposition looks dimensionally incorrect, since Newton does not introduce the dimension of time in rates of changes of quantities. Only I must observe, that the vulgar conceive those quantities under no other notions but from the relation they bear to perceptible objects. And it will be convenient to distinguish them into absolute and relative, true and apparent, mathematical and common. [...] instead of absolute places and motions, we use relative ones; and that without any inconvenience in common affairs; but in philosophical discussions, we ought to step back from our senses, and consider things themselves, distinct from what are only perceptible measures of them. It is interesting that several dynamical quantities that were used in the book (such as angular momentum) were not given names. The dynamics of the first two books was so self-evidently consistent that it was immediately accepted; for example, Locke asked Huygens whether he could trust the mathematical proofs, and was assured about their correctness. However, the concept of an attractive force acting at a distance received a cooler response. In his notes, Newton wrote that the inverse square law arose naturally due to the structure of matter. However, he retracted this sentence in the published version, where he stated that the motion of planets is consistent with an inverse square law, but refused to speculate on the origin of the law. Huygens and Leibniz noted that the law was incompatible with the notion of the aether. From a Cartesian point of view, therefore, this was a faulty theory. Newton's defence has been adopted since by many famous physicists - he pointed out that the mathematical form of the theory had to be correct since it explained the data, and he refused to speculate further on the basic nature of gravity. The sheer number of phenomena that could be organised by the theory was so impressive that younger "philosophers" soon adopted the methods and language of the Principia. The mathematical language of the Principia. The reason for Newton's use of Euclidean geometry as the mathematical language of choice in Principia is puzzling in two S. Chandrasekhar, in one of his last major efforts, translated the Principia into modern mathematical language so that physicists of today can read and appreciate the book that founded modern physics. The second puzzle is historical. Why did Newton revert to Euclidean methods, when seventeenth century mathematics increasingly used Descartes' analytical geometry for its transactions? Newton himself had written earlier tracts using this language. Even his earlier communications on the calculus of differentials referred to a new language of fluxions that he had invented. In fact, his early notebooks suggest strongly who knew very well the general nature of Newton's mathematical discoveries. Location of copies of the Principia. A page from the Principia. The Wren Library in Trinity College, Cambridge, has Newton's own copy of the first edition, with handwritten notes for the second edition. The Whipple Museum of the History of Science in Cambridge has a first-edition copy which had belonged to Robert Hooke. Fisher Library in the University of Sydney has a first-edition copy, annotated by a mathematician of uncertain identity and corresponding notes from Newton himself. The Pepys Library in Magdalene College, Cambridge, has Samuel Pepys' copy of the third edition. The Martin Bodmer Library keeps a copy of the original edition that was owned by Leibniz. In it, we can see handwritten notes by Leibniz, in particular concerning the controversy of who invented calculus (although he published it later, Newton argued that he developed it earlier). A first edition is also located in the archives of the library at the Georgia Institute of Technology. The Georgia Tech library is also home to a second and third edition. A facsimile edition was published in 1972 by Alexandre Koyré and I. Bernard Cohen, Cambridge University Press, 1972, ISBN 0-674-66475-2. 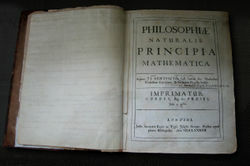 Second edition of the Principia. Richard Bentley, master of Trinity College, influenced Roger Cotes, Plumian professor of astronomy at Trinity, to undertake the editorship of the second edition. Newton did not intend to start any re-write of the Principia until 1709. Under the weight of Cotes' efforts, but impeded by priority disputes between Newton and Leibniz, and by troubles at the Mint, Cotes was able to announce publication to Newton on 30 June 1713. Bentley sent Newton only six presentation copies; Cotes was unpaid; Newton omitted any acknowledgement to Cotes. However, Newton omitted acknowledgements to some because of the priority disputes. John Flamsteed, the Astronomer Royal, suffered this especially. Third edition of the Principia. The third edition was published 25 March 1726, under the stewardship of Henry Pemberton, M.D., a man of the greatest skill in these matters ...; Pemberton later said that this recognition was worth more to him than the two hundred guinea award from Newton. The second edition of 1713 had an essay attached, titled General Scholium, which was to become one of Newton's most notable writings. Newton criticizes Descartes and Leibniz, and famously states Hypotheses non fingo "I feign no hypotheses", besides attacking the doctrine of Trinity.